Let’s get started with today’s topic…Plural Nouns! Making plural nouns is simple: 1 computer - 2 computers. Pretty straightforward, right? Wrong! Can you imagine how language would be if we always used the same words when speaking, reading and writing? If everything (person, place, object…) in the world had only one word to refer to it, the world would be a very boring place. Well, in order to make language a lot more expressive and interesting we should try to vary the words we use as often as we can (but not too often). That’s where synonyms come into the picture! This article will provide you with 10 tips on how to approach grammar exercises in English. A tag question consists of two parts: a statement and a shortened yes/no question that refers to it and asks if the first statement is true. The two parts are separated by a comma. English verbs have 5 principal parts with which other forms are derived using verb auxiliaries: base/stem, simple past/preterit, past participle, present participle and the infinitive (the “name” of the verb). Some also include the third person singular in the present tense as a principle part, as it is the only verb form that kept its inflectional ending in Modern English. While we usually add the suffix s/es/ies to turn nouns into plural, there are some exceptions to these rules. In this article, we will give examples of the rules for the irregular plural nouns. Turning a singular noun to plural in English has very specific rules and many exceptions to these rules. This article will present you with the singular-plural rules in English. Tense aspect and mood are basic grammatical concepts in English. Learning them is crucial and made fast and easy with the knowledge of Whitesmoke! Enter now. Transitive verbs require at least a direct object to complete their meaning, while intransitive verbs do not require any objects. Some verbs are bi-transitive, meaning that they are followed by both a direct and indirect object. Transitive verbs followed by an indirect object usually require a preposition. Stative verbs are verbs that describe a state or situation, not an action. They are used in the Present Simple even if they describe a situation that is true at the moment of speaking or writing. A clause is a group of words that contains both a subject and a predicate but cannot always be considered as a full grammatical sentence. Clauses can be either independent clauses (also called main clauses) or dependent clauses (also called subordinate clauses). A phrase is a group of words that does not contain both a subject and a predicate and therefore cannot stand alone as a clause or sentence. There are a few kinds of phrases. Dynamic verbs convey a sense of active change. They are usually used in progressive verb tenses, which denote an on-going activity. The categories in the following tables will give you a good idea of these concepts. Finite verb forms are namely, conjugated verbs that show person, number, tense, aspect, and voice. Finite verbs, as opposed to non-finite verbs, can function as the main verb of an independent clause. Non-finite verb forms, or verbals (infinitive, past participle, present participle, and gerunds by themselves) are not limited by the subject and serve as other parts of speech in the sentence (nouns, adjectives). Most verbs are main verbs, i.e. content words that contribute meaning to the sentence they are in (go, run, eat, prefer, ascertain). In addition, there is a closed class sub-group of auxiliary verbs that merely assist in the technical construction of other verb forms. The auxiliary verbs in English are: to be, to do, and to have. The modal verbs (can, could, shall, should, may. might, must, will, and would) can also be considered auxiliaries as they modify the meaning of the main verb they accompany. Most verbs in English are regular verbs, meaning that they add the ed ending to form both the simple past and the past participle forms, which are identical, such as play-played-played. However, there is a considerable number of irregular verbs (about 450, but only about 200 in common use) that form their simple past and past participle forms with a vowel change, such as in see-saw-seen (see table below). Some irregular verbs do not change form at all (let-let-let). Irregular verbs originate mostly from Old English, while any new verb coined in later periods tends to be regular. Still, the ten most used verbs in English are irregular. A Yes/No question is a closed question, meaning that it has one of two answers, yes or no. It asks whether something is true or not, i.e., whether the original positive sentence is valid. A question element needs to precede the subject in order to form this question. A Wh question is an open question, meaning that it can have any number of answers. It asks about some missing information the speaker needs. This corresponds to the different sentence elements, such as the verb, objects, manner, place, time, purpose, etc. Questions about the subject have a special form (see the next section). A question element needs to precede the subject in order to form this question. Tests for verbs: A good way to identify a verb when a word is in doubt is to ask, Can I do it? I can succeed (do it) is correct but I can success is incorrect. This means succeed is a verb and the related part of speech success is not a verb; in this case, success is a noun. A basic sentence is composed of at least one independent clause. A clause is composed of a minimum of a subject and a predicate. Without one of these elements, the clause is ungrammatical. Nowadays, there are modern approaches to grammar, which bring it alive and relate it to our real life, outside of outdated grammar books containing endless lists of grammar rules. The older prescriptive grammar approach, used to have students theoretically analyze sentences for correctness in literary and religious texts, as if they were training to become linguists. This was based along the lines of the traditional approach to the instruction of ancient Latin and Greek, which were not even used in speech in the Middle-Ages onwards. The purpose was preserving the formal standard usage of these languages while treating grammar as a theoretically isolated area of study. Linking verbs are a sub-group of stative verbs that denote a state of being, connecting the subject with a complement, usually an adjective describing the subject (not the verb). Dynamic verbs, by contrast, are followed by adverbs modifying them, rather than by adjectives. Knowing whether to use who or whom is a confusing aspect of the English language. Many times in verbal conversation, you can hear people use "good" as an adverb. This is an incorrect use of the word. Some adjectives are absolute and some are not. Here is a quick tip to help you understand the difference. When is something implied and when is it inferred? Another one of the confusing pairs in English, this tip explains the your/you're distinction. A quick tip about a common confusion between the words "elude" and "allude". Probably the most common error in English writing is the confusion around when to use "it's" or "its". When should you use "I" and when should you use "me"? Do you need a quick "getaway" or "get away"? What is the difference? Read this tip to find out. Did you see the incidence or the incident at the party? Read on to find out. How do you pluralize a compound noun? Using the example "brother-in-law", we'll show you how in this quick tip. Altogether now, or, All together now? Read this quick tip to find out. This is a nice, simple rule. Never use could of. It is always could have. Seen or saw? Read this quick tip to find out why, and where, to use seen or saw. There is a lot of confusion around when to use "fewer" and when to use "less". Read this quick tip to help you learn the correct usage of these two terms. Here is a quick, easy-to-read overview of subject-verb agreement. What is a dangling modifier, and how do you detect one? Read this quick tip to find out. When should you use he, she, him or her in English? Read on to find out. The key to subject-verb agreement is matching the number of both; singular subjects take singular verb forms, as plural subjects take plural verb forms. The trick is (1) to recognize singular v. plural subjects, which is not always easy (an “s” at the end of a word is not the only sign of subject plurality), and (2) to know the difference between singular and plural verb forms. The difference between dependent clauses and independent clauses must be understood in order to create properly structured English sentences. We'll help! English grammar refers to the structure of words and sentences in English, or to the description of this structure. Come and learn English grammar with WhiteSmoke. Grammar rules – although the term may evoke memories of endless memorization of dry rules with no apparent use, grammar can actually be a fascinating subject. English grammar rules are actually very useful if not vital for English usage and English writing, if one wants to get messages across confidently and effectively. Learning the grammar and knowing how to apply it is an important part of mastering a language. Grammar rules in English may seem less complicated than those in other languages for some people, but we are fully aware of the difficulties encountered with English grammar, especially for beginners, when trying to apply the rules when writing in English. 3 Main Tenses - Stay Consistent! It is easy to confuse your tenses when writing, especially in long sentences. See a real example we found online, and learn how to fix your own writing. We learned in school that good writers should avoid using the passive voice. Yet this is one grammar lesson in particular that we all seemed to have forgotten . . . or never really understood in the first place. Determiners are small words that go in front of nouns (also known as “noun modifiers”). The main purpose of determiners is to “mark” a noun, or to “determine” its context. Determiners identify which person or thing a sentence is describing. Sometimes, determiners “determine” if the noun/pronoun is definite or indefinite. Determiners can also describe to whom the noun belongs, or how many of the noun there are. We already explored the importance in auxiliary verbs in English grammar. To refresh your memory, auxiliary verbs are helper verbs – they are small action words that can help to express the mood or tense of regular verbs. “Auxiliary” means “to help or support”, and that is exactly what auxiliary verbs do. Adverbs serve to modify or give more information about a verb, an adjective or another adverb. They give information on how an action (verb) is being done. Adverbs often end in ‘ly’. Especially for ESL learners, the plural forms of many English nouns can be tricky. This entry gives tips on plural nouns in English. Adverbs and adjectives bring spice and color to the English language, but it is important for native and non-native speakers alike to learn how to correctly use them in a sentence structure. Traditional English grammar divides words into eight parts of speech: verbs, nouns, pronouns, adjectives, adverbs, prepositions, conjunctions, and interjections. There are a few more terms also often used to define words, such as articles and gerunds. The English language can be hard to master. Even those who have been using it all their lives may have difficulty with proper grammar. 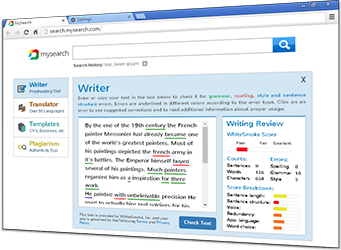 The use of English grammar software can teach good grammar and punctuation. Syntax is a form of grammar, concerned primarily with word order in a sentence and with appropriate sentence structure. Perfect you syntax with WhiteSmoke. The tense of a verb indicates when the action is carried out. For a good understanding of English grammar and writing, you need to distinguish between different verb tenses and know when to use each tense. 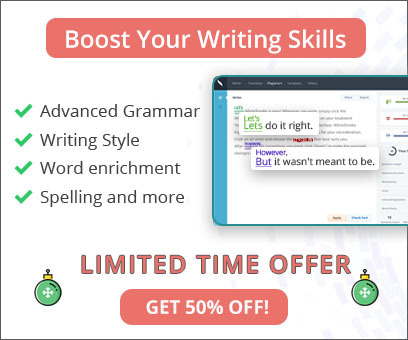 Have you ever wished that you could write or speak English using perfect grammar? Here’s good news for you: it’s possible! To achieve this, you can start with these five useful tips. There are mistakes that people commit quite frequently when speaking or writing in English, three of which are listed here. Watch out for these three, and you are on your way to better English grammar. The apostrophe is perhaps one of the most misused punctuation marks in the English language. If you are not sure how this punctuation mark should be used, then check out these three tips on how to use apostrophe properly.